Wow thanks for the tutorial Null, I now have the torches in the editor, BUT they do not show up after compile... I think I have to clean up my Q2 folder because it is filled with mods/files -_-. When I ship a map, where do I put the textures and models. I don't know how to make the folders, if I try my map in my "none-editing" Q2 copy it can't find my textures even though I put them in baseq2/textures. in quake2/weapons directory in order to have custom model support. In console you can always type the command "info" to check that you're in fact running from the correct directory with the correct mod files loaded. Alternatively you can start quake2.exe / r1q2.exe or q2pro.exe directly. Then in console type: "game weapons" followed by "gamemap yourmapname" if Quark isn't doing the job. I suspect you might just not have the correct weapons version installed, so a fresh extract should fix that. 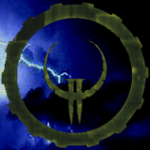 Check Quark configuration that it points to the correct Quake 2 installation. Btw usermodel path should not include "models" in it. As far as .wal files, you can put your textures in textures/giftdm folder or textures/e1m2, just not directly in textures itself or you'll get a bunch of warnings. Textures and models should load fine residing within baseq2 since Quake2 always checks this directory as fallback. When in doubt you can examine the texture paths and contents of the .map files in a text editor such as notepad to see if there are some path discrepancies. I also generally try to keep all the texture filepaths lowercase to prevent any linux case mismatches later on the DM server. You can also use entdump.exe to see what entity string the compiler puts in the bsp file to make sure the usermodel entity paths exist locally. What model entity should i use in order to place these animated models inside my map? Misc_model? or model_spawn.Iam mapping with TrenchBroom. Model_spawn is supported by the Lazarus mod, the modified 3ZB2 bot I made, KMQ2, and probably several other other server-side mods. Keep in mind that it's not a part of stock/vanilla Q2. Misc_model is used in Quake3 engine mapping, unless some other Q2 mod I'm not aware of has added it. There's also a model_train variant that follows path_corners just like a func_train. Since iam working on a short game with idtech2.I will be good to port my stuff to your Kmquake2,but how do i set kmquake2 for mapping,and does kmquake2 only support .pk3 or supports PAK as well? Iam making a game simillar to Thirthy Flights of Loving(who also used your engine). Any documentation i can go trought?